Anyway, on Friday night thanks to the awesomeness that is Netflix, Daniel and I finally got around to watching “Where the Wild Things Are.” This was probably my favorite book as a child, so I was excited to see how the book would play out on the big screen. And it certainly did not disappoint! First off the characters on screen were identical to the look of those in the book! But it wasn’t the look of the film that left me in TEARS…not just misty-eyed semi-crying…but actual tears…identical to those I had after watching Marley and Me (if you have not seen this movie and are an animal lover, see it now…but make sure to have a tissue handy!). The movie brought me back to the days of being a kid. Sure the story is sad as the child is going through some painful stuff, but it shows that place in a kid’s life… on the brink of remaining an imaginative child and on the verge of well, growing up. There is a scene before the boy goes to meet the wild things where he narrates a story to his mother and she types it for him on the computer. This started my tears early because I used to do the same thing with my mom. I was always a writer, even before I could actually read and make words, and she would help me make my stories come to life on paper. 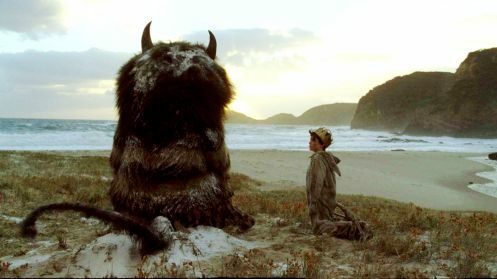 When the boy meets the wild things in his imagination… just little instances were reminiscent of my imaginative childhood…the happy, carefree times, but also the sad moments. Some critics have complained the movie ends “abruptly” but I don’t think so…. It is just like our childhood… gone in a fleeting moment and before you know it we are adults stressing over work and family issues. The boy realizes at the end when he goes back home that he needs to grow up and start to change some things about himself. While he certainly is still a kid at the film’s end, you are left with a feeling that it won’t be much longer before he actually does “grow up.” The end scene when he is leaving after waving to his “friends” really tore me up because you know it is the beginning of the end to his childhood. And we can never go back to being kids. It was very emotional for me. I loved being a kid, when each day was carefree. When I would play outside, run around barefoot all day, catch raindrops on my tongue and then catch lightening bugs at dusk (I always set them free!) These memories are precious to me, and I know things will never be like that again. I am very happy with things now, but sometimes I guess… I just miss those childhood days. Would I recommend kids seeing this? That is a toughie, I would definitely read the book to them…but perhaps wait a couple of years for them to truly get and appreciate the movie. So the movie as a whole, I recommend… especially if you want to relive your childhood… for maybe just two hours. I agree completely! This movies really was just great. It did look so much like the book. The Wild Things themselves were so amazing you were really able to feel an emotional attachment to them; that is a very difficult thing to do with a computer generated character (I'm looking at you Jar Jar). The movie really hit home with me being a son of divorce. I was around Max's age when my parents divorced and this movie really nailed the emotion and conflict a child can feel through all that. Beautiful movie and if you don't agree you just didn't get it. Also great first blog wife.